Serving all 50 states with local offices in California, Florida, Illinois, Nebraska, New Mexico, Tennessee, Texas, and Virginia. Not sure what you are looking for? Talk to a Licensed Attorney Now Free, 15 minute, no obligation consultation. Select a product or service below to find out more. Fast, affordable and effective formation services for your limited liability company (LLC), including all docs and Operating Agreement. Protect your identity with an anonymous LLC. L4SB will act as your organizer and registered agent, so the State of NM will not know ownership information. Is your current LLC doing business in another state? If so, you need to register it as a Foreign LLC to avoid problems down the road. Leverage the expertise of L4SB to help you form your new C-Corporation or S-Corporation, with the right paperwork and filings to the State. Need a high quality Registered Agent in your state? All states served. Great for businesses without a physical address. Why trust such an important transaction to anyone other than an experienced transactions attorney? L4SB has your back. Licensed trademark attorneys on your case for the same cost as “the other guys.” Includes free trademark assessment. L4SB will conduct a risk assessment of your name against registered trademarks and common-law marks, using a “likelihood of confusion” analysis. An experienced trademark attorney will look at the notice you received from the USPTO and advise you with a flat-rate quote to respond. L4SB copyright attorneys will help you register your copyright, price includes the US Copyright Office filing fee. Want to talk to a licensed trademark attorney before proceeding? 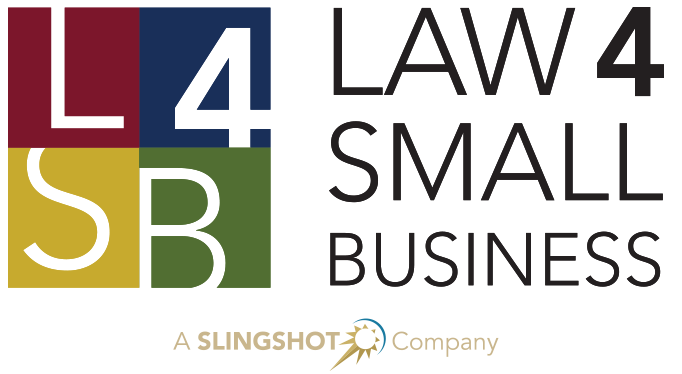 For a low flat-rate cost, you can speak with L4SB’s trademark attorneys. Are you planning to license your software, invention or art? Make sure that you are protected with a L4SB Custom licensing agreement. For $20/page (min. 5 pages), L4SB contract attorneys will read and review your contract, and advise you on issues identified. Just want a template document to get started? L4SB templates are the initial starting point for our contracts attorneys. A unique and specifically written contract to handle your important client (or customer) interactions. Does your business need a custom contract? Time to call a lawyer. Let one of L4SB’s expert contract attorneys write one for you. Let L4SB negotiate on behalf of your businesses best interests. A must for buying, selling or shutting down a business. Call for details. For a flat-rate fee, L4SB litigators will write a letter on your behalf and make a legal demand for the goals and objectives you indicate. We will generate a “Demand Letter” or “Cease and Desist Letter”, after reviewing your documents and information, and advising you on the best approach. Hire L4SB to generate a “Demand Letter” after reviewing your documents and information, and advising you on the best approach forward. Let an expert L4SB attorney look over you contract and determine the best course of action for you and your business. Get what’s yours. Are you considering a lawsuit? Have you been sued? Don’t fight it alone! Our attorneys can help you make sense of the situation. Hire L4SB to negotiate the best possible settlement for you and your business—outside of court. Hire L4SB to fight for your right to a piece of tangible property owed to you or your small business. Dissolving a LLC is oftentimes more work than simply filing Articles of Dissolution. Trust L4SB attorneys to help guide you through this difficult process. Use an experienced transactions attorney to review your closing documents before you join, form or leave that partnership! Registered Agent Services provided for all 50 states. Use a licensed business attorney for your companies registered agent. 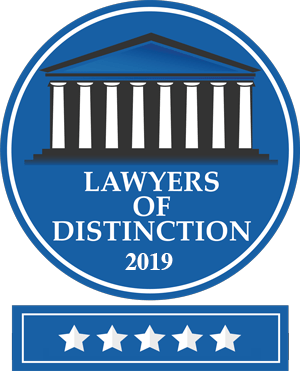 © 2019 Law 4 Small Business, P.C. All Rights Reserved | Web Design by Noaviv Design & Development. Please check your inbox to confirm your subscription. You will then receive a link in your inbox to download your free E-Book! 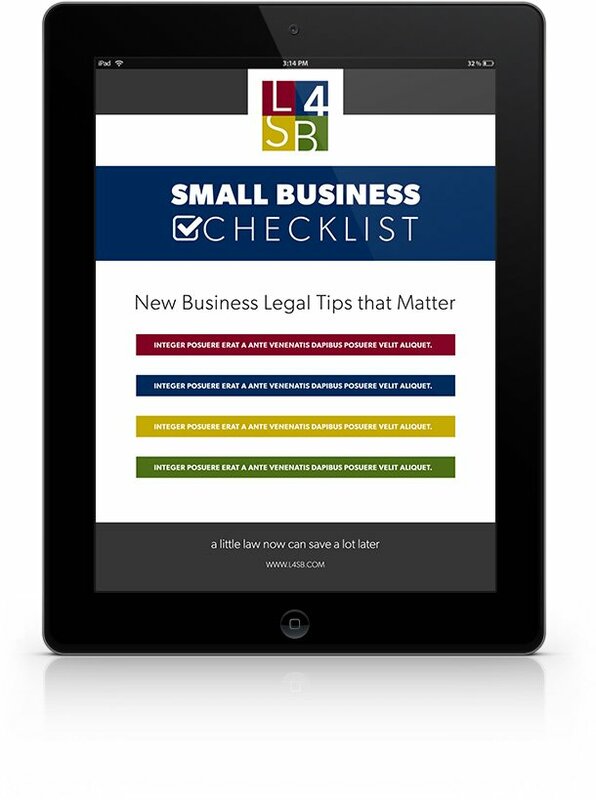 Receive your "Starting Your Own Business" E-Book and stay up to date on important business tips and articles. Your information will *never* be shared with a third party. You may unsubscribe at any time by e-mailing [email protected] or clicking the link in our newsletter.